Here is another painting of this beautiful bird, this time with its feathers spread in a mating display. 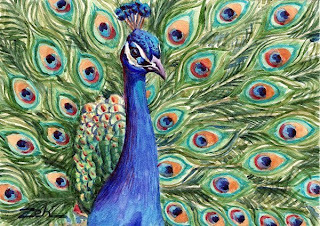 The male, referred to as a peacock, is the one with the bright colors and magnificent plumage. The female peahen is duller with only some iridescent plumage and no display feathers. These feathers, by the way, are not the tail. They are supremely elongated upper tail coverts. The male's tail is brown and short like the female's. A native of the Indian subcontinent, peafowl have been kept as pets and ornamental birds in other parts of the world. In medieval times, they were served by nobility at banquets, stuffing the meat into the bird's plumage for show. Since their meat is tough, though, and not the most desirable delicacy, sometimes people cheated and stuffed the feathers with a more tender fowl. Hmmm....tastes just like chicken.